You will spend the night in an equipped Desert camp Berber Tent .with drum music in the middle of the Moroccan Sahara. This will be great opportunity to take lovely pictures of the sunset and sunrise , when we arrive at the camp we walk to the high dunes to watch the sunset. It will be a magical night when the sky is clear and we can watch stars. During this night, there will be dinner around a campfire and you will spend the night in nomad tents. In the morning Qfter the sunrise you will ride the your camels backing to the hotel where you’ll have the breakfast and shower in the hotel in Merzouga. Prices depend if you travel in high or low season. 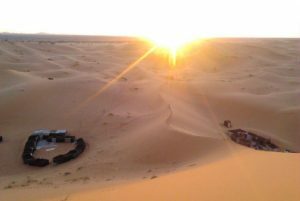 How to get to Merzouga using Morocco’s public transport, departing from Marrakech? (From Marrakech to Merzouga)? – The bus (Supratours) departs from Marrakech to Merzouga daily at 8.00am and arrives in Merzouga at 21:00. How to get to Merzouga departing from Fes? (From Fes to Merzouga)? – The bus (Supratours) departs from Fes to Merzouga daily at 19:00 night and arrives in Merzouga at 06:00am. How will we meet in Merzouga (desert)? 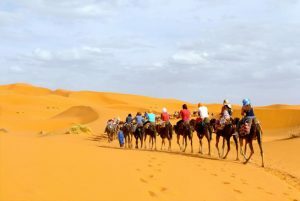 – We organise the desert tour from a hotel near the desert , so (1) If you are coming to Merzouga by a rental car we will wait for you in Rissani town, 35km before Merzouga Erg Chebbi, and then we will guide you to Sahara Erg Chebbi For your camel trek. (2) If you are coming by bus, we will wait for you at the bus station in Merzouga or Rissani. NOTE: Please, before departure from any city of Morocco.